ESTA SEMANA SANTA, HEMOS TENIDO LA INMENSA ALEGRÍA DE ENCONTRARNOS CON UNAS INSTANTÁNEAS POR REDES SOCIALES DE UN VIEJO AMIGO. UN AMIGO QUE VISITABA BADAJOZ ACOMPAÑADO DE SUS SERES QUERIDOS QUE SON LOS QUE SI SON NACIDOS EN ESTA CIUDAD, UN AMIGO AL CUAL CONOCEMOS HACE MUCHOS AÑOS, Y AL QUE NOS UNE LA PASIÓN POR TODO LO TRADICIONAL Y MÁS ESPECIALMENTE SI ESTO ESTÁ ARRAIGADO AL PUEBLO , EMANA DE FORMA NATURAL Y SE HACE CON GUSTO. LA AMISTAD CON JULIO SURGIÓ A MEDIADOS DE LOS 80 , CON LAS PRIMERAS CELEBRACIONES AUTONÓMICAS DEL DÍA DE LA REGIÓN QUE EL PRIMER AÑO SE CELEBRARON EN GUADALUPE (OTRA DE NUESTRAS MADRES Y REINAS) , Y DESPUÉS PASARON A LA LOCALIDAD DE TRUJILLO. EN ESTAS OCASIONES EL COMO MIEMBRO DEL GRUPO “EL REDOBLE” DE CÁCERES Y NOSOTROS COMO MIEMBROS DE COROS Y DANZAS DE BADAJOZ, REPRESENTAMOS EL FOLKLORE DE LA ALTA Y LA BAJA EXTREMADURA, FUIMOS UNA DE LAS PARTES IMPORTANTES DE ESTAS CELEBRACIONES Y FUIMOS DURANTE UNOS POCOS DE AÑOS, EL BROCHE FINAL PARA EL CIERRE DE LA FIESTA EN MEDIO DE LAS PLAZAS TANTO DE UNA COMO DE LA OTRA POBLACIÓN. TAMBIÉN FUIMOS REPRESENTANTES EXTREMEÑOS EN ALGUNAS CELEBRACIONES EN MADRID E INCLUSO HASTA BÉLGICA FUIMOS A PARAR PARA LLEVAR NUESTRAS MÚSICAS Y NUESTRAS DANZAS EN AQUELLO QUE SE DIÓ EN LLAMAR “EXTREMADURA EN CLAVE92” Y QUE ADEMÁS DE PARA HACER CONOCER NUESTRA TIERRA, A MÍ PERSONALMENTE ME SIRVIÓ PARA MI PROPIO ENRIQUECIMIENTO PERSONAL YA QUE ADEMÁS DE LA CONVIVENCIA CON MI GRUPO “COROS Y DANZAS DE BADAJOZ”, ME HIZO CONOCER A UNAS PERSONAS MARAVILLOSAS DE LAS CUALES CONSERVO TODAVÍA SU AMISTAD Y CARIÑO, “LOS INTEGRANTES DEL GRUPO EL REDOBLE DE CÁCERES”. LAS OBLIGACIONES , LA FAMILIA, Y TANTAS COSAS MUCHAS VECES NOS HACEN IR DEJANDO DE UN LADO LAS AFICIONES, PERO EN UN RINCÓN DE NUESTRO CORAZÓN SIEMPRE SE GUARDAN ESTOS MOMENTOS QUE VIVIMOS, CON EL ORGULLO DE HABER SIDO ANFITRIONES DE OTRAS CULTURAS, DE HABER SIDO EMBAJADOR DE TU TIERRA PERO QUIZÁS DE LO QUE MÁS ORGULLOSO ME SIENTO ES DE LAS PERSONAS A LAS QUE HE CONOCIDO. GRACIAS A LAS REDES SOCIALES UN DÍA ME ENCUENTRO CON UN VIEJO AMIGO DE ESTAS ANDADURAS FOLKLÓRICAS , JULIO SAAVEDRA, Y HEMOS TENIDO LA INMENSA ALEGRÍA DE HABERNOS VUELTO A ENCONTRAR EN NUESTRA TIENDA, QUE YA SABÉIS MUCHOS, QUE ES UN POCO UN PUNTO DE REUNIÓN FOLKLÓRICO, LÚDICO, Y JUERGUÍSTICO DE MUCHOS PERSONAJES YA NO DEL MUNDO FOLKLÓRICO DE LA REGIÓN SE PUEDE DECIR QUE INTERNACIONAL, YA QUE HEMOS TENIDO INCLUSO VISITAS DE PERSONAS A LAS QUE CONOCIMOS HACE 30 AÑOS, Y QUE SU RESIDENCIA HABITUAL ES A MILES DE KM DE NUESTRO PEQUEÑITO BADAJOZ. 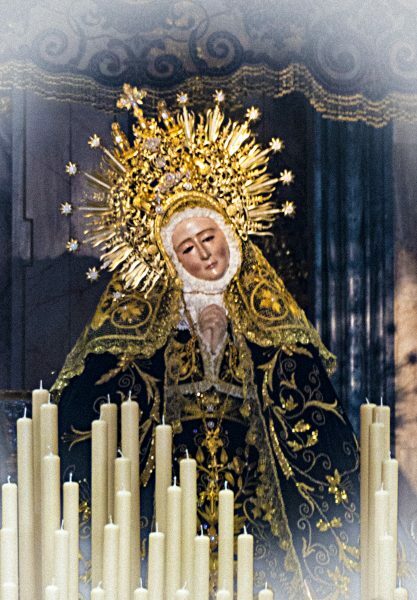 PUES BIEN, HEMOS MANTENIDO LA RELACIÓN Y ME ENCUENTRO HACE 2 DÍAS CON UNA MARAVILLOSA FOTO ECHA POR JULIO SAAVEDRA DE NUESTRA VIRGEN DE LA SOLEDAD, DE NUESTRA SEÑORA DE BADAJOZ, DE NUESTRA MADRE…. Y SE OFRECIÓ MUY AMABLEMENTE A MANDARNOS SU FOTO PARA PUBLICARLA , Y COMO NÓ LE PEDÍ UNAS LETRAS. NOS LA MANDA CON UNAS FRASES QUE SOLO PUEDEN SALIR DE UNA PERSONA CON SU SENSIBILIDAD Y SU GUSTO POR LA TRADICIÓN , POR LAS COSAS BIEN ECHAS Y CON GUSTO. GRACIAS AMIGO JULIO, GRACIAS POR TU CARIÑO A NUESTRA PATRONA, Y SÉ DEL CARIÑO QUE TE UNE A ESTA CIUDAD QUE POR SUPUESTO TAMBIÉN ES LA TUYA, Y POR SUPUESTO NUESTRA MADRE QUE TAMBIÉN ES LA TUYA Y LA DE TODOS. LA SEÑORA DE BADAJOZ…..NUESTRA VIRGEN DE LA SOLEDAD.